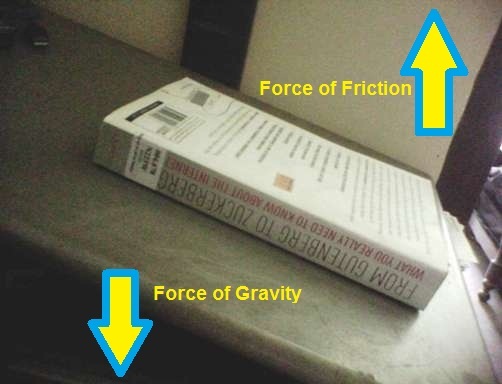 Friction opposes the relative motion between two surfaces in contact. It acts on both the surfaces. Friction depends on the nature of surfaces in contact. For a given pair of surfaces friction depends upon the state of smoothness of those surfaces. Friction depends on how hard the two surfaces press together. Static friction comes into play when we try to move an object at rest. Sliding friction comes with play when an object is sliding over another. Sliding friction is smaller than static friction. Friction is important for many of our activities. Friction can be increased by making a surface rough. The sole of the shoes and the tyres of the vehicle are treaded to increase friction. The friction is sometimes undesirable. Friction can be reduced by using lubricants. When one body rolls over another body, rolling friction comes into play. Rolling friction is smaller than the sliding friction. In many machines, friction is reduced by using ball bearings. Fluid friction can be minimised by giving suitable shapes to bodies moving in fluids. Friction opposes the relative motion between the surfaces in contact with each other. Friction depends on the nature of surfaces of surfaces. Sprinkling of powder on the carom board reduces friction. Sliding friction is smaller than the static friction. Question 2. Four children were asked to arrange forces due to rolling, static and sliding frictions in a decreasing order. Their arrangements are given below. Answer : a. Wet marble floor, dry marble floor, newspaper and towel. Question 4. Suppose your writing desk is tilted a little. A book kept on it starts sliding down. Show the direction of frictional force acting on it. Question 5. You spill a bucket of soapy water on a marble floor accidentally. Would it make it easier or more difficult for you to walk on the floor? Why? Question 6. Explain why sportsmen use shoes with spikes. Question 7. Iqbal has to push a lighter box and Seema has to push a similar heavier box on the same floor. Who will have to apply a larger force and why? Question 8. Explain why the sliding friction is less than the static friction. Question 9. Give examples to show that friction is both a friend and a foe. It is must for building construction, Without friction no building could be constructed. It produces heat. When a machine is operated, heat generated causes much wastage of energy. Question 10. Explain why objects moving in fluids must have special shapes. Answer : when objects move through fluids such as air or water, they have to overcome fluid friction acting on them. In this process they lose energy and overall efficiency decreases. In order to save the energy, being wasted against fluid friction, objects moving in fluids, are modified and given special shapes. Such modified shapes which are also known as streamlined shapes or aerodynamic shapes helps in reducing fluid friction to an greater extent. What role does friction play in the sport of your choice? Collect some pictures of that sport in action where friction is either supporting it or opposing it. Display these pictures with proper captions on the bulletin board of your classroom. Imagine that friction suddenly vanishes. How would the life be affected. List ten such situations. Visit a shop which sells sports shoes. Observe the soles of shoes meant for various sports. Describe your observations. 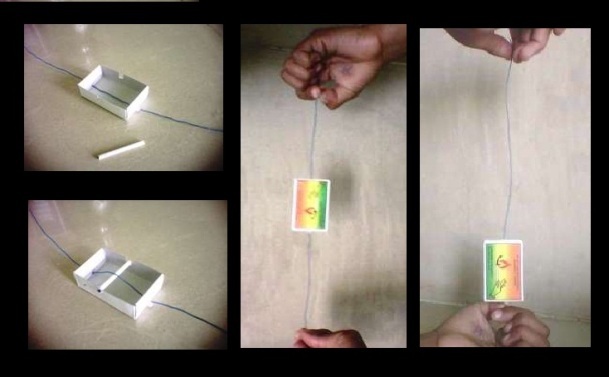 A toy to play with: Take an empty match box. Take out its tray. Cut a used refill of a ball pen of the same width as the tray as shown in the figure below. Fix the refill with two pins on the top of the tray as shown in Figure Make two holes on the opposite sides of the tray. Make sure that the holes are large enough to allow a thread to pass through them easily. Take a thread about a metre long and pass it through the holes as shown. Fix beads at the two ends of the thread so that it does not come out. Insert the tray in the outer cover of the matchbox. Suspend the match box by the thread. Leave the thread loose. The match box will start falling down due to gravity. Tighten the thread now and observe what happens. Explain your observation. Can you relate it to friction?